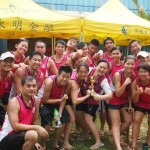 Come join our Dragon Boat team! CNY Dinner 2013 – what a blast! Nice big group photo taken at CNY dinner. Thanks for those who came! The night was filled with fun and laughter. Hope to see more people in our next big gathering!